Taste test: These wide-rippled, kettle-cooked chips are very, very crunchy and taste quite good. It's a much moister taste than the also-delicious Dark Russet variety that Cape Cod makes, sort of midway between those and the regular chips in terms of taste. The chips themselves are about the same color as the regular Cape Cod chips, but these seem to have a darker ring around their very edge, which I assume is the unpeeled potato skin. 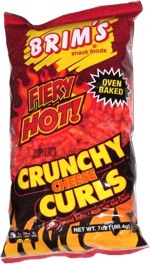 These are a great option if you want to dip and still enjoy the greatness of a Cape Cod chip. Smell test: Very, very nice russet potato smell. Trivia: This bag was a free sample from the end of the tour at the Cape Cod Potato Chips factory. 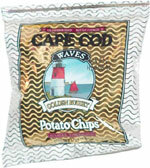 This snack was discovered by Jeremy at Cape Cod Potato Chip factory, Hyannis, Massachusetts. Review published .